Pumps and Sprays , the same company that brought you Hypro and Imovilli Pumps presents Flojet’s new Triplex Automatic Water System Pump for potable water. The Flojet Triplex Automatic Water System Pump from Pumps and Sprays is ideal for a range of applications including RV. Marine, Caravans and domestic auto water systems. The Flojet Triplex Automatic Water System Pump from Pumps and Sprays contains an internal bypass which provides even flow characteristics and reduces the need for an accumulator tank. The New Triplex 3526–144 is a Triplex series pump containing three diaphragms. 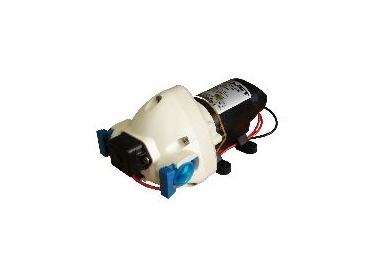 The Flojet Triplex pump from Pumpps and Sprays installs with simple, quick connect ports and adjustable rubber mounting feet. It runs at pressures up to 50 PSI quietly with a built-in pulsation eliminator to control unwanted cycling and noise, and with automatic operation turning pumps on and off when a tap or valve is opened or closed. The new Triplex Flojet pumps from Pumps and Sprays can run dry and are designed with a sealed, water resistant motor housing making them corrosion resistant. Triplex Flojet pumps are also self priming to 9 feet. For further information contact Pumps and Sprays on 02 96279898.